What writing different numbers of words per day looks like at the end of one year. A few months ago I visually illustrated the impact of daily, consistent effort. Regardless of what you do, taking action on a regular basis will result in some change. In thinking about writing, I put together the infographic above. As I mentioned in a previous post, my goal is to write 1,000 words per day for all 366 days of 2016 (this is a leap year). Each year I use a Moleskine journal for my yearly planner. The hardcover version of the Moleskine journal that I use has 240 pages. For several years I have had the same thought: I would like to write one full page per day (approximately 275 words for me), which would result in a 66,000 words. Think about it ... only one page per day, but a huge result at the end of the year. In the infographic, you can see the same type of effect. 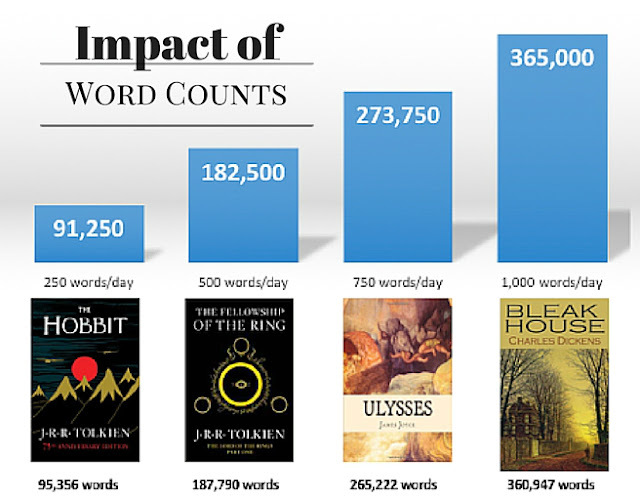 Writing 250 words every day would result in 91,250 words, approximately the same length as The Hobbit by J.R.R. Tolkien. Similarly writing 1,000 words per day would be slightly more than the word count for Bleak House by Charles Dickens, 360,947 words. These word counts come from the Word Counts of Famous Books infographic. Of course, there is more to a successful book than simply a large number of words. The story must be compelling, and the writing descriptive and powerful. However, what keeps many aspiring writers from actually becoming writers is the production of words. If you are already writing, keep writing on a regular, consistent basis. If you have only dreamed of writing, get a journal or start a new document in your word processing program and writing something every day.